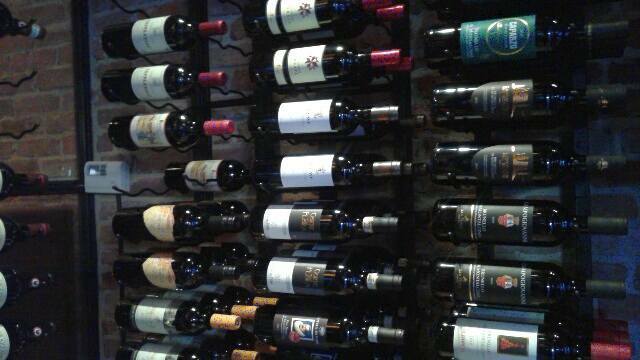 Toscano = location: it's on the corner of Brattle Street in Harvard Square. Inside, we favor the chic bar with mirrors and bottles and a view, if you're tall, into the kitchen. It's Sunday and it's lunch. It's clearly lunch, not brunch. No eggs for us, thanks, and Toscano obliges. It's the only place I find in Harvard Square or anywhere that's egg and pancake-free. This is their usual plan, lunch every day along with dinner. It also occurs to me, after years of writing about the best places to eat now, that right after the actual eating, the next best thing is reliving it as I tell you. Dining with me, you know I don't eat anything out that I make at home. Since they are not on hand at Chez Cat, I eat oysters and sushi out. I do not roll my own maki and I'm not learning. We know where I find my Island Creek oysters. Though I make tomato sauce and grate cheese, you will find zero risotto in a pan here nor at Chez Julie. These are things we want from someone else's kitchen. Which is why we're out. On the way in we see the 1,000 bottle wine cellar's in fine working order and we adore hosts who are this pleased to see us. 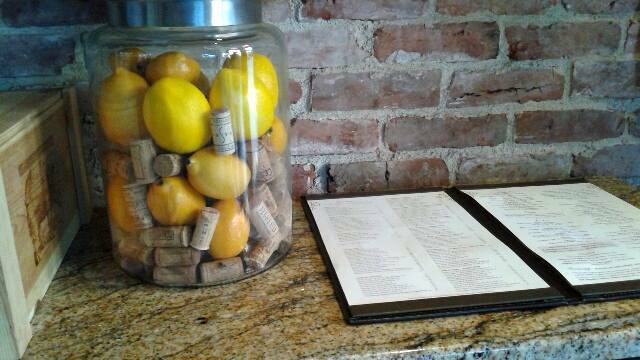 It's noon and Julie picks Chardonnay Tormaresca, a generous pour of citrus, peach and mineral. (A wine list that speaks all things Italian hits frizzantes, extensive reds and Northern Italian, Central and Southern whites.) It turns out we do more lunches than dinner so one drinks, the other doesn't. No one seems to mind exactly. Still, I miss out and on occasion, I get a look. If only there were less of an expectation of work after lunch. 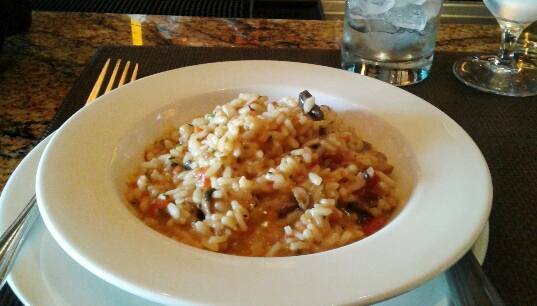 Today's special is mushroom risotto. Julie agrees it's creamy what with tomato and wild mushrooms and parmigiano reggiano stirred into a mellow mix. An ideal lunch, we agree, that neither she nor I ever find at home. There are more risottos at dinner: brianzola (sausage and saffron), frutti di mare, and ortolano (zucchini, eggplant and asparagus). The purist, who is attached to traditional preparations, goes for a new experience with calamari today. 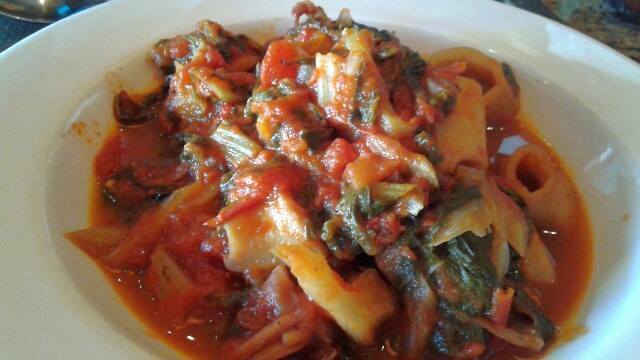 This is in zimino, Tuscan style with tomato and chard or spinach. And red pepper. When you see red pepper on Toscano's menu, heed it. It's red and it's hot. I'm guessing there's celery, chard and onion along with those chili peppers. The calamari's grilled, not fried, and the presentation is soupy in a good way that calls for their focaccia. I don't usually wax on bread since carbs are verboten now and forever. In this case, we bend or as we call it, it's a Sunday cheat. Dense, light and soon we're addicted, what with the salt, and because a chef pulled it from the oven just for us. Focaccia comes in handy for the risotto, happily for us, sitting in a touch of soupy prep. 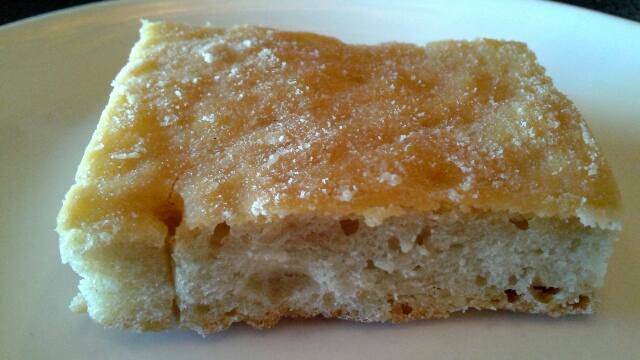 And the focaccia even complements the wine. Okay, okay we're overdoing. But we wonder, is it better than cake? Today there is absolutely no question. Our bartender, Auri, who mentions she's here at Toscano since day one, pours olive oil and balsamic into a shallow dish but for us this focaccia needs neither. If there had been butter, which there was not, someone would have had to bring in a crane. There are your butter people and there are your olive oil people. Though we did not, you could choose soup pasta e fagioli, salads of caprese, cesare, and beets; and panini with eggplant or meats. As well, there are pizzas margherita, salsiccia, speck, sopressata, fungi and quattro formaggi which means if there are six of you, and each passes a piece, lunch will be pizza perfect. We miss those days and we miss them aloud. You will find ten pastas including clam, veal and bacon with white wine. And main courses take in swordfish, cod and salmon; we have our eye on the sautéed chicken livers. All this and it's lunch. Just when we think we are done, it turns out we are not. 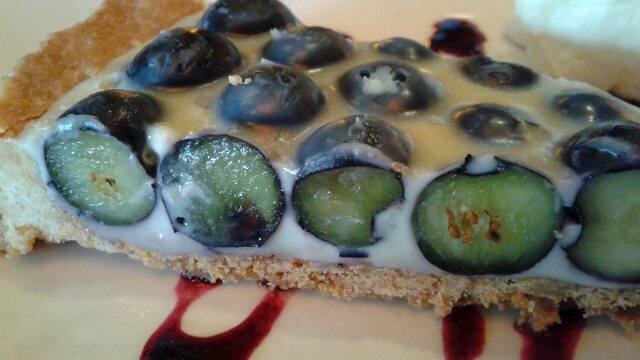 Here are the biggest blueberries, for November anyway, in white chocolate with ice cream and raspberry sauce. It's creative and we toast it. Toscano corners the market when it comes to berries and it isn't even summer. I don't think it matters that I, given the chance, would opt for custard over cioccolata bianca. Of course not. We think you'll find this informal yet formal looking, soft jazz, friendly setting even better come Spring with windows on Brattle and all manner of curios in the Square.